DrinkWire is Liquor.com's showcase for the best articles, recipe and reviews from the web's top writers and bloggers. 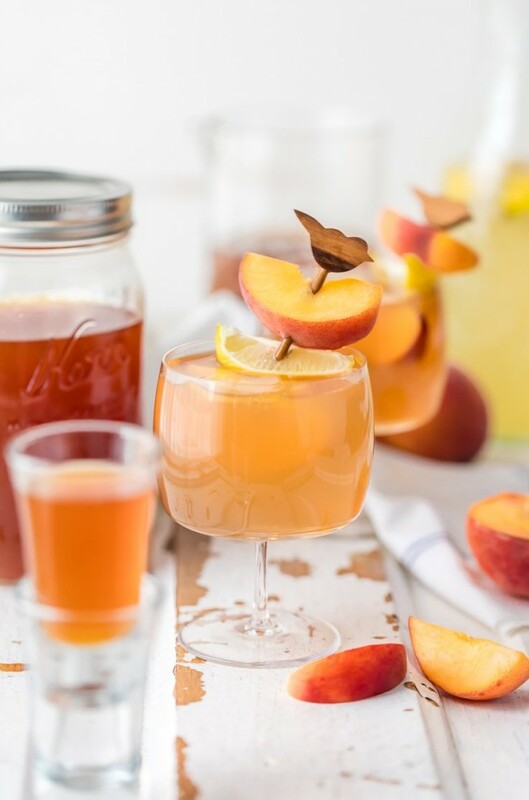 In this post, The Cookie Rookie shares ideas for a summery peach tea infusion. 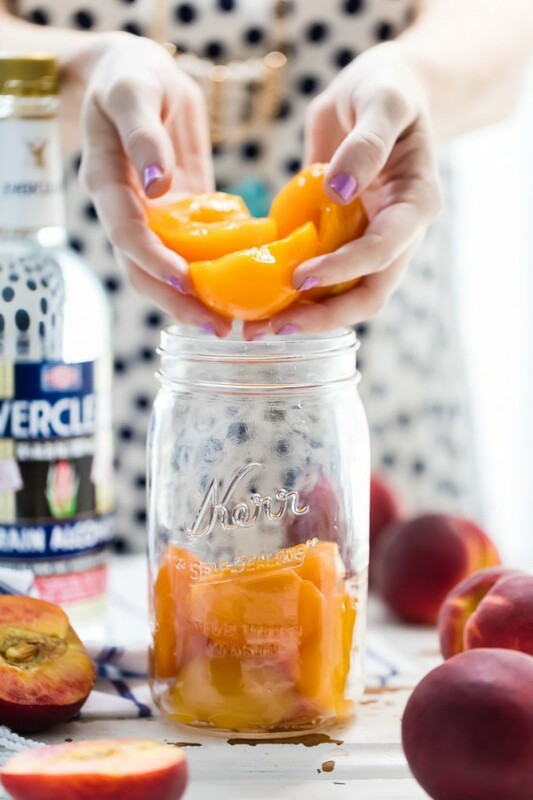 Homemade Peach Tea Vodka is an easy and fun DIY liqueur. 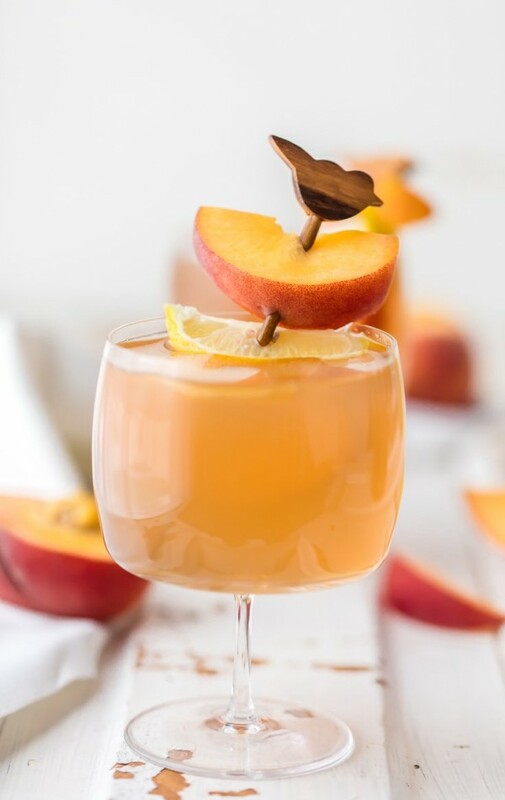 Easily made by infusing neutral spirits with peaches and black tea, the perfect mixer for so many summer cocktails! I can’t even tell you how excited I’ve been for today’s post!! I have wanted to do some infusion liqueurs for a long time, and today is finally my chance! Not only can you make delicious flavored vodka at home, it’s easy and fun!! I have been avoiding it for way too long, thinking I would be bad at it or not do it right. Well, I was wrong. It’s a simple way to make homemade gifts, create tasty drinks at home, or just get creative in the kitchen. I’m hooked and can’t wait to keep trying new flavors. Today I am starting out strong with the perfect homemade drink for Summer, Peach Tea Vodka!! It works well in lots of drinks, but my favorite way to use it as a mixer is in Spiked Peach Arnold Palmers. So much to love! You ready?? Brace yourselves for lots of pictures, even more than normal. I had so much fun with this and can’t wait to share. The process couldn’t be easier, but does take a bit of time. Since this is a dual flavor vodka (peaches plus black tea), I did it in two steps, over 48 hours. It’s only a couple of minutes of prep time total, but you do need to let it sit for a long amount of time to pull out enough flavor. Using fresh peaches is perfect in Summer, but during the rest of the year it’s totally fine to use bottled or canned peaches. I let the peaches sit in the Everclear for 48 hours before draining, being sure to turn over the bottle a couple times a day to make sure all the peaches were being touched by the Everclear. Easy peasy. The tea step takes a lot less time to infuse, so I only let it sit with the tea bag for 10 minutes. I found the flavor was plenty strong, but you can brew it to taste. After I removed the tea bag, I let it sit in the fridge and get as cold as possible before mixing. Peach Tea Vodka makes the perfect gift, especially if you put it in a mason jar and label it with cute calligraphy. I can’t write calligraphy, but you get the idea. :) If someone made me homemade flavored vodka as a gift I would be SO excited. YOU CAN DO IT! After you’ve made the Peach Tea Vodka is when the real magic happens! You’re left with the ultimate fun Summer drink mixer, ready for your favorite cocktails! My first thought was to use it to make Spiked Peach Arnold Palmers. GOOD DECISION! I mixed a shot of the homemade Peach Tea Vodka with half iced tea and half lemonade for the ultimate Summer Sip. Doesn’t this just scream deck weather?? Thanks for indulging all these pics. I had so much fun making my first infusion and can’t wait to make more! I have a few ideas, but I’m going to let them be a surprise. I hope you love this Peach Tea Vodka as much as we do. Let me know if you make it for any friends or family! Add the peaches to a quart sized (32 ounce) mason jar or large glass jar. The peaches should fill to the top. Add more or less as needed. Add in the lemon juice, no need to stir. Pour in grain alcohol until it reaches the top of the jar. For me it was about 2 cups, but pour more or less to get to the top of the jar. Seal with an air tight lid and turn up and down a couple times to make sure the peaches are fully submerged and all parts touching the grain alcohol. Place in the fridge for 48 hours, turning/very slowly shaking twice a day. After 48 hours, Strain the liquid from the peaches using a fine mesh strainer. Pour the infused grain alcohol back into the large mason jar. Add the large tea bag or two small tea bags to the boiling water and dunk in and out, allowing the tea to infuse the boiling water. Once the tea seems to have infused the water, pour the cup boiling water (plus the tea bag) into the infused mixture and stir to combine. Seal and allow the tea bag to sit within the Everclear for 10 minutes. Meanwhile, heat the 3/4 cup sugar and 3/4 cup water over medium high heat on the stove. This will make a simple syrup. Stir to combine until the mixture boils, then reduce to a simmer for the remaining time until the tea bag has fully infused. After 10 minutes, remove the tea bag and pour in the simply syrup to the mixture. Stir to combine. Store the vodka in an airtight container in the fridge until ready to use. It's best to let it fully chill before serving. Add to your favorite cocktails, like the Spiked Peach Arnold Palmer! Combine the Peach Tea Vodka, lemonade, and iced tea in a large glass over ice. 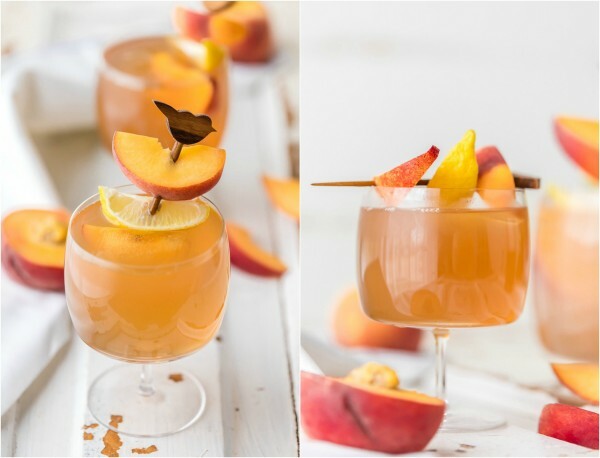 Garnish with lemons and peaches.